A Hindi book of poems titled Shanti Ki Afwayen written by Dnyaneshwar Mulay, a senior Indian diplomat, author and columnist, was released at Pravasi Bhartiya Kendre, New Delhi. M J Akbar, an eminent journalist and a senior politician was the chief guest of the function while Kiren Rejuja, minister of home affairs, Government of India attended the event as a special guest. 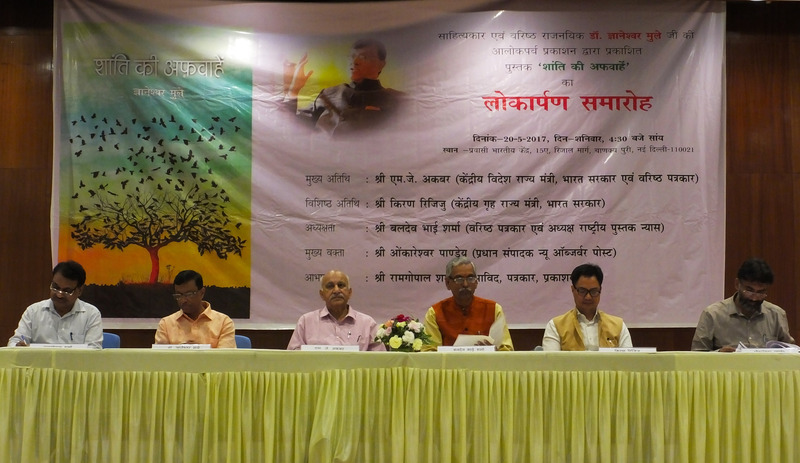 Besides Baldeo Bhai Sharma, senior journalist and author, Ramgopal Sharma, publisher of the book and Onkareshwar Panday, editor-in-chief of New Observer Post were also present at the launch. The book deals with a number of issues ranging from daily life situations to geo-political issues and also has an element of romanticism. Panday recited some of the poems from the book and also pointed out the range of issues the author has covered in his poems. “In the poems of Mulay, besides getting the reflections of daily life, one finds the bigger issues like terrorism and many other issues the world is facing right now” Panday explains. “In this way the author in his book tries to make us understand how the world is talking about peace but in actuality these are just the rumours which is what Shanti Ki Afvahen the book title means,” Panday went on to add. Akbar, who himself is an author of many prominent books, said, “A diplomat keeps the dictionary of all the languages and he gets a chance of understanding many cultures and issues, which is what can be very clearly found in the poetry of Dnyaneshwar Mulay”. Muley himself recited some of his poems from the book and explained how he manages to write while holding a prominent government position. He said that he believes and strongly follows the ideology that every file he receives while working has a small story and each of these stories can be narrated into a poem. “It sometimes becomes very difficult to write while being in government as we follow a particular frame work but one has to keep all the instincts open all the time to write about the issues we face every day,” Muley added to enunciate his point. 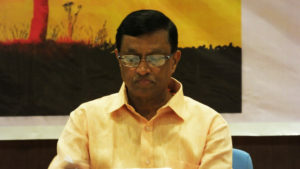 Dnyaneshwar Mulay is the Secretary MEA (Ministry of External Affairs and Overseas Indian Affairs). He started his journey of writing from the very early days of his life. As a student, his writing used to be predominantly romantic, but with time he started writing about the varied issues of life. He writes in different languages like Hindi, Marathi, English and some of his writings are also in Urdu and Arabic.